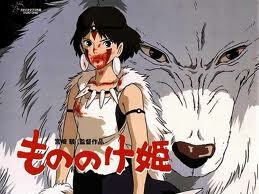 Mononoke Hime (Princess Mononoke) is perhaps the most popular Miyazaki Hayao movie in the English-speaking world. This is not surprising. Princess Mononoke is an action-packed fantasy, one set against the stage of a clash between man and nature, progress and superstition, trust and betrayal. 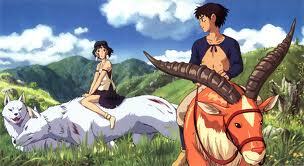 Princess Mononoke has been so popular in the English-speaking world that, as of April 2013, it will be adapted to the stage in London's New Diorama Theatre. For more information on the stage play adaptation, click here. But why the popularity? Princess Mononoke is a good movie. But it is by no means great. It would not even make my list of Miyazaki Hayao's top 5 movies (his five best are, in no particular order, Spirited Away, My Neighbor Totoro, Nausicaa of the Valley of the Wind, Porco Rosso, and Raputa: Castle in the Sky. Check out our review of Porco Rosso). Nor is it his best movie on humanity's conflict and trials within an unforgiving, wild, and uncaring natural world. I'll touch more on this below. Again, let me stress that I do like the movie. After all, Miyazaki does a lot right. First, he constructs a beautiful and engaging world, creates interesting and complex characters, and tells a fine tale of adventure. This is a truly visually inventive film, one that has had an impact far beyond the world of animated movies. 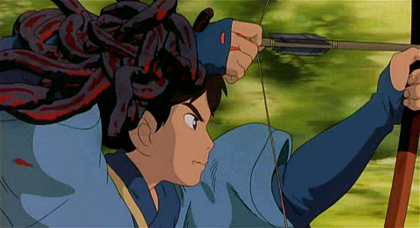 Moreover, the main character, Ashitaka, is perhaps the most complex main character in any Miyazaki film. Ashitaka was an Emishi tribesman (a real historical people from northeastern Japan) and a descendant of the royal family, destined to lead his tribe. At the movie's outset, Ashitaka protected his tribe from a rampaging cursed god (tatari-gami), killing the boar-god before it left his village in ruins. But this fight left Ashitaka cursed. The curse took both a spiritual and a physical toll on Ashitaka. To find out the nature of the curse and, hopefully, to discover a cure, Ashitaka was forced to abandon his topknot, his homeland, his tribe, and his claim to tribal leadership (did he leave voluntarily or was he, the cursed man, exiled?). Ashitaka traveled to the southwest, the direction from which the cursed boar-god had come, to learn more. At the same time, his curse exacted a fierce physical toll, leaving him in obvious physical pain. Ultimately, he finds his answers by wandering into a war waged between humans and nature, which I will not spoil for you. This is not his war, and he doesn't belong on either side of the conflict. Ashitaka is thus a man with no place: his curse forced him to leave his village and his old life, and at the same time, he has no place in this new life, dominated by a conflict between man and nature. Just as a war is being waged within his own body as the curse spreads, a war between the human town of Tataraba and the true wild (the kind that scared Henry David Thoreau out of his breeches) is threatening the natural world itself, threatening to change it into something tame. This is a story of a human war to tame nature. In the process, something magical and fearsome is lost. 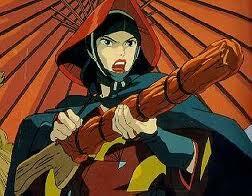 Lady Eboshi is another complex and fantastic character. The head of the town Tataraba, Eboshi is the cause of the war to tame nature. She is a compassionate character towards her human subjects, and is especially nice toward the women, the lepers, and the infirm in the town. In fact, her help and support keeps the lepers alive and cared for. But Eboshi is merciless in the pursuit of her utopian world, a world where man no longer has to fear nature. She would not hesitate to sacrifice her men, her friends, or even herself in the pursuit of this ideal. Strong ideals might lead to a human paradise, but at the expense of something much grander. Despite the excellent cast of characters, Princess Mononoke feels overly preachy. Granted, it is not an overtly environmentalist movie, even though Miyazaki is making definite claims of humans taming nature and molding it to their own ends. The trope of man vs. nature is dealt with in a subtle way, where both sides are fighting for their share of the emerging order. But Miyazaki deals with this trope and the complexities of good vs. evil in a much more subtle manner in Nausicaa of the Valley of the Wind. Nausicaa combines a wondrous and dangerous world with a complex story of kingdoms at war, lust for power, fears of and desires for weapons of mass destruction, and a slowly regenerating natural world. Nausicaa encapsulates so much of the human experience that it would be remiss to call it anything other than a masterpiece. 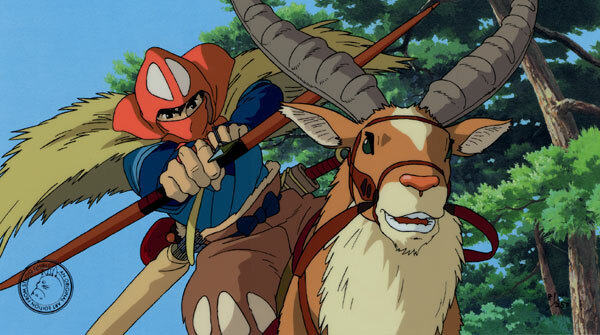 Princess Mononoke, however, while good as a standalone movie, feels tame in comparison. Mononoke could never reach the heights of Nausicaa. Bonuses: +1 for a gorgeous world. +1 for the best main character I've seen in any animated film. Penalties: -1 for being overly preachy. -1 for a one-dimensional female lead character.